Application forms for nursery are available from the office at the school. Planning our party – Pass the parcel, ice lollies, pizza, sausages, chocolate cake for party food. Pin the nose on Rudolph and visit from Santa. A visit to see “Too Many Penguins” at the Macrobert Art Centre. 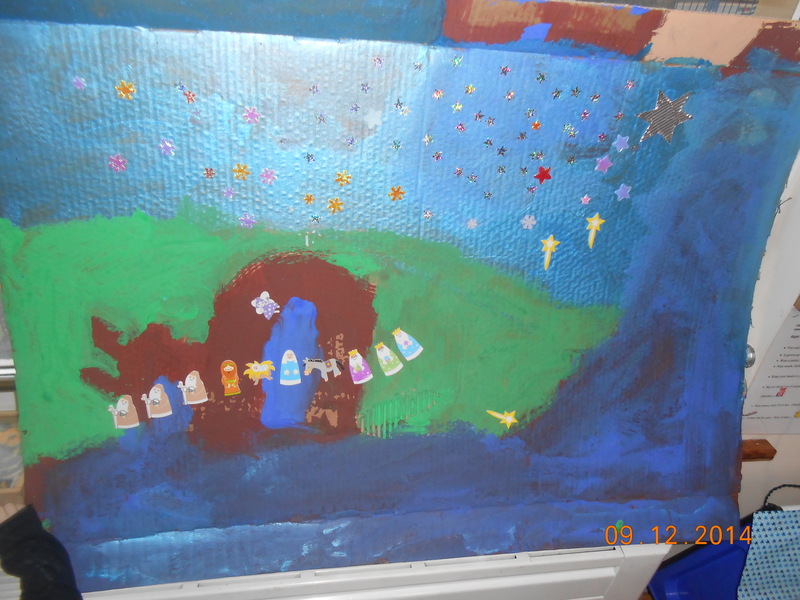 Designing and creating the backdrop for the nursery nativity performance. We are going to be learning about Frozen. This context for learning has arisen from the children’s interest in ice, snow, crystal growing experiments, melting, penguins and animals from cold climates, role play and the popular film Frozen. Consultation with the children on this has developed ideas and an icy, frozen themed hex-bug habitat has already been constructed and is being used. We are planning, working as a team and using tool safely. The role play area has been transformed into an ice palace and there are now penguins, orca and walrus in the water tray snow. The nursery children visited Ochlochy Park for a forest school session on 16th December. Inspired by a previous visit and an interest in the “Stickman” story we used sticks to make Reindeer art and floated some Pooh sticks down the burn. We also fed the ducks “Two slices of brown bread” because the sign at the entrance to the park says only feed them brown bread. We then enjoyed a lovely snack of birthday cake and fruit. UPDATED BY NURSERY MEDIA GROUP, Rosie, Hannah, Ben, Eilidh, Mia, Eve, Pippa. We are delighted to share with you our latest Care Inspectorate Report, which reflects the excellent standards of care, support and learning our nursery provides. I would like to take this opportunity to congratulate the nursery staff on this achievement and thank them for their outstanding commitment to our nursery and the children in our care. The outcome of this inspection is under revised inspection standards and therefore achieving the current excellent grades recognises the commitment to the continual improvement of our service. Nursery children visited Ochlochy Park for their nursery session. Snack, energetic play, a skeleton making challenge. A skeleton from sticks and other natural resources. The nursery day comprises of a balance between planned and unplanned activites. The unplanned activities arise as a result of the nursery being set up as a workshop, allowing children time and space to choose, experiment, explore, practice and interact with others as they play. These photographs will provide you with a view of how we learn this way.